Halloween is over and people are thinking about Thanksgiving and Christmas. As we gear up for the for the holiday season, many of us are also looking forward to apple picking, ice skating, sledding, skiing and snowboarding. Upon returning home from these festive family activities, there are few things more enjoyable than cozying up to a wood stove or pellet stove. 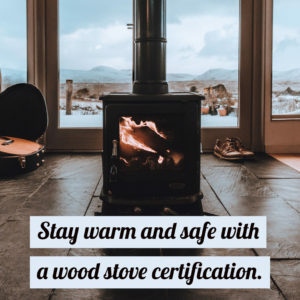 We at Grush Inspections can quickly and affordably provide you with a wood stove certification. Why Do I Need A Wood Stove Certification? In 2015, the Environmental Protection Agency passed a law called the 2015 New Source Performance Standard (NSPS) for New Residential Wood Heaters, New Residential Hydronic Heaters and Forced-Air Furnaces at 40 CFR Part 60 (Subpart AAA). The 2015 NSPS law dictates that every imported wood heater and every wood heater sold at a retail location on or after 05/15/15 must be certified to not discharge any more than 4.5 grams/hr of particulate matter. In other words, wood stoves as well as pellet stoves must be certified to be reasonably clean burning. The Air Quality Division of the Washoe County Health Department allows the certified home inspectors at Grush Inspections to perform pellet stove inspections and wood stove inspections throughout the county. Failure to get a pellet stove certification or wood stove certification can result in a costly fine from the county. Contact us today, and we’ll get you on your way to cozy fall and winter seasons. Don’t forget that we also offer residential inspections, pest inspections, commercial inspections, heating and air conditioning inspections and fireplace inspections.